Speaking at the international liturgical conference in Cork, organised by the St Colman’s Society for Catholic Liturgy, Cardinal Burke gently raised the topic of excessive concelebration. See David Kerr's article on CNA: Cardinal Burke cautions against over-use of concelebration. Cardinal Burke's comments reinforce a point made by Cardinal Cañizares, prefect of the Congregation for Divine Worship back in March when he said that daily "private" concelebrations are not part of the Roman tradition. Both Cardinals seem to be referring to the practice in many houses of study where priests routinely concelebrate, perhaps with a rota for principal celebrant so that your turn comes up every couple of weeks or so. Newly ordained priests in a house which has this custom might well be helped by the comments of the Cardinals if individual celebration is frowned upon. Another question is that of assisting in choro (i.e. being on the sanctuary in a cassock and cotta but not concelebrating.) I very much like to do this at major celebrations; normally I have said a parish Mass earlier in the day and there is no "pastoral need" for me to binate. Assisting in choro gives a priest a different way to participate at Mass - as a priest. Practically there are some things that need to be put in place if individual celebration of Mass is to be facilitated. There is more work for the sacristans - though houses in Rome that offer chapels for individual celebrations usually have a sensible system in place with the requisites for Mass available for priests to make use of. Then there is the question of servers. 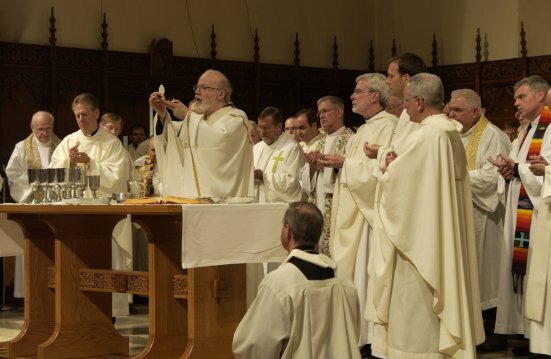 It is (at the least) not optimal for the priest to celebrate Mass on his own and without a server, though this has, since the advent of concelebration, become commonplace. Both theologically and liturgically there should be at least one other person making the responses and representing the populus Dei. Before concelebration it would have been common at shrines and houses of studies for priests, for there to be students or devout men who were ready to serve Mass for a priest. This provided an opportunity for them to participate at the Mass more closely. Priests who are on holiday together might also think about serving each others' Mass. The Mass that you serve is an excellent preparation or thanksgiving for the Mass that you celebrate. Having said all that, by way of exception, I am going to concelebrate this evening at Mass for the fiftieth anniversary of a priest who taught me many years ago. Please remember him in your prayers and give thanks for his priestly service.